The US election cycle has been a riveting, engrossing spectacle. The elections might just be for the President of the United States, but they’ve caught the attention of the world like no election in recent memory. And even non-US citizens seem to have an opinion on who should be America’s next President. A site from the Netherlands attempted to find out who’d win if the US elections were held in every country. Worldwide.vote ran a global poll of respondents around the world, and tried to figure out where the two candidates had the most support. And the results have been surprising, to say the least. 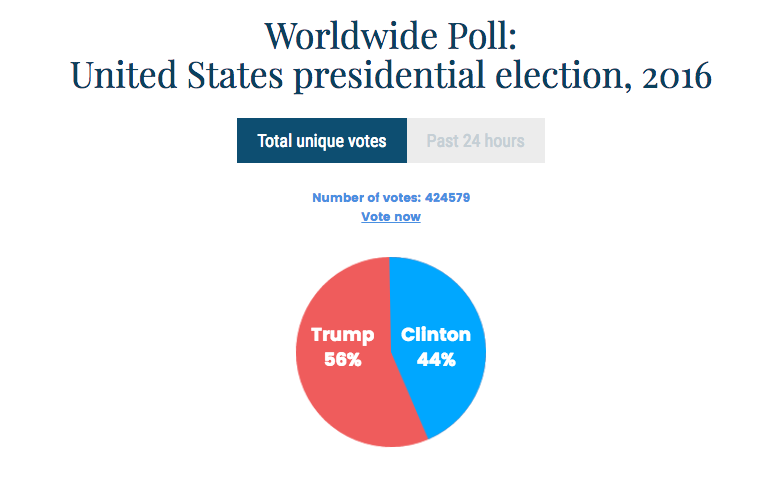 According to the poll, which ran over the weeks leading up to the election and got over 400,000 votes, Donald Trump seems to be the global favourite, ahead of Hillary Clinton. Donald Trump won 56% of the overall global vote to Clinton’s 44%. In this anonymous poll, Trump seems to be ahead of Clinton even in the US, where he leads 54% to 46%. There were 147918 respondents in the poll, much greater than the sample sizes of the polls performed by major US media outlets. The country-wise breakup was also fascinating. Trump finds broad support in Europe, where his anti-immigration theme would’ve struck a chord. All of Europe,other than Italy, seems to be behind Trump . He also finds support in Australia, another country that has been grappling with issues of illegal immigration, and not unsurprisingly, Russia. Trump even seems to find support in Muslim-majority countries like Turkey and Egypt and even Iraq, though the total number of polled respondents in these regions was smaller than those in Western nations. Clinton is ahead in places like Sweden and Norway (Finland, though, seems to be pro-Trump) and Japan. Clinton also does well in India and China. India, in fact, seems to have some of Clinton’s strongest backers, with 78% of those polled supporting the Democratic party candidate. While this is an online poll and doesn’t have a lot of scientific validity, the site did have several measures in place to ensure that it wasn’t gamed. Only one vote per IP was allowed, and the votes cast in the various countries seems to be generally consistent with internet usage across the globe. And if its results are to be believed, Donald Trump is the world’s choice for US President.